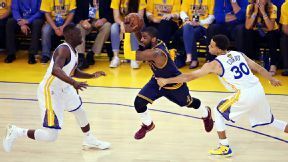 OAKLAND, Calif. -- Cleveland Cavaliers star Kyrie Irving will have an MRI on Friday to determine whether he suffered any damage to his left knee during overtime of Game 1 of the NBA Finals. Irving collapsed as he was driving with the ball with two minutes left in the Cavs' 108-100 loss to the Golden State Warriors and grabbed his left knee, which has been bothering him with tendinitis for the past six weeks. Initial tests done by the Cavs' medical staff revealed no damage to Irving's anterior cruciate ligament or medial collateral ligament, but he said this issue felt different. The Cavs, according to a source, hope Irving avoided any structural damage, but all parties are going to wait on test results before making any decisions about Irving's ability to play in more games. When he left the locker room, he was limping significantly, and he exited the arena on crutches Thursday night. "It was very tough to see," LeBron James said. "I've seen how hard he worked these last eight days just to get himself to play at this level tonight." Irving had played well, scoring 23 points with 7 rebounds, 6 assists, 4 steals and 2 blocked shots in Game 1. His block on Stephen Curry late in the fourth quarter helped the Cavs push the game to overtime. "I hope it's just a reaggravation," Irving said. "It's disappointing; coming in, I felt amazing. It's a setback." Irving has had at least one other MRI on the knee and visited Dr. James Andrews to evaluate the knee during the Eastern Conference finals. Irving has missed two of the Cavs' past six playoff games, and this was the third time he was unable to finish because of aggravating the knee. Game 2 is Sunday night in Oakland. "It's something I hate to see," Warriors coach Steve Kerr said. "I hope he's OK for the rest of the series." Information from ESPN.com's Dave McMenamin and The Associated Press was used in this report.